Not kidding. Dressing for job interviews is the worst! Especially interviews at super cool, cutting edge companies where everyone has impressive resumes and super hip extracurricular interests. Be yourself... but a clean, nicely dressed version of yourself. Shoes and accesories are where you can show your creative side. Mine were snakeskin with gold accents and the gorgeous, fashionable receptionist noticed them immediately. Match the office- if everyone else is in jeans and you're in a suit that's not good. 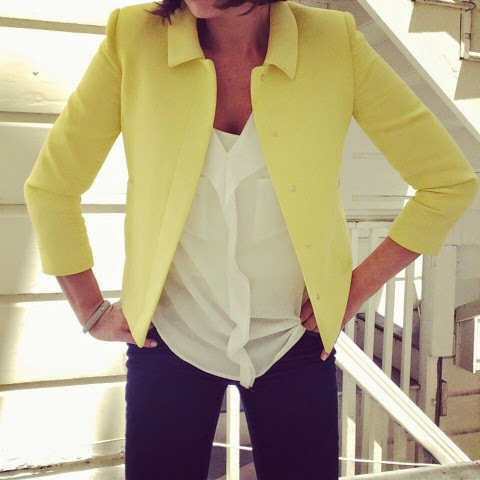 A bright color is acceptable when paired with a classic cut, like this highlighter meets Jackie O combo. You want to look creative, but also professional.